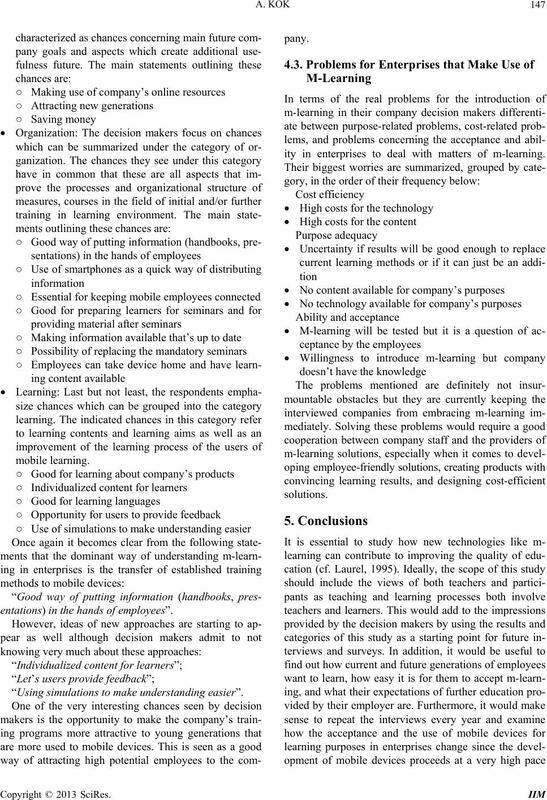 m-learning in a corporate setting. more in the following qualitative research study. training contexts  or higher education contexts . and how it can be defined and analyzed. successful use of mobile devices to enhance learning . der the devices bulkier and therefore less portable. vices in completely online courses. managers are highly involved in the training process. 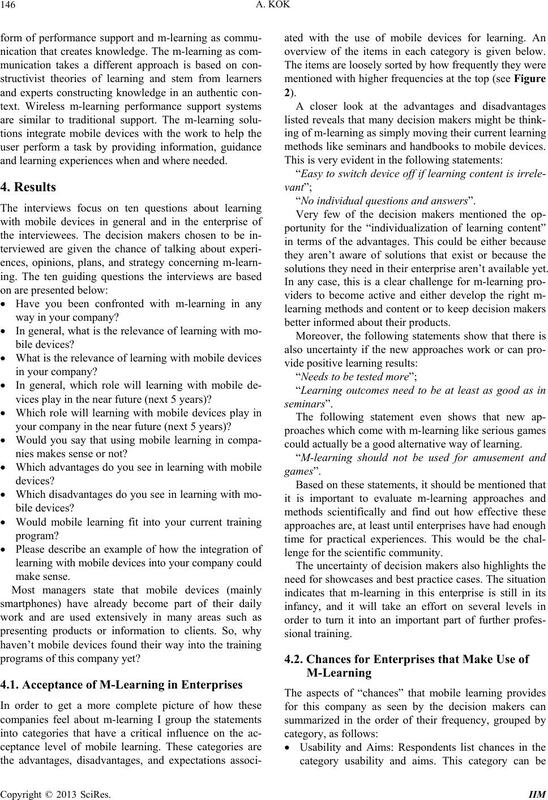 interviews have been conducted during February, 2013.
such as social and mobile learning technologies. environment with the following characteristics. Figure 1. mFOR@ main modules (display in Turkish). Figure 2. How decision makers in enterprises see the acceptance of the use of m-learning. need to dictate the notes in the classroom to the learners. also be imported or exported. and learning experiences when and where needed. vices play in the near future (next 5 years)? your company in the near future (next 5 years)? nies makes sense or not? programs of this company yet? overview of the items in each category is given below. methods like seminars and handbooks to mobile devices. “No individual questions and answers”. solutions they need in their enterprise aren’t available yet. better informed about their products. could actually be a good alternative way of learning. lenge for the scientific community. entations) in the hands of employees”. “Using simulations to make understanding easier”. 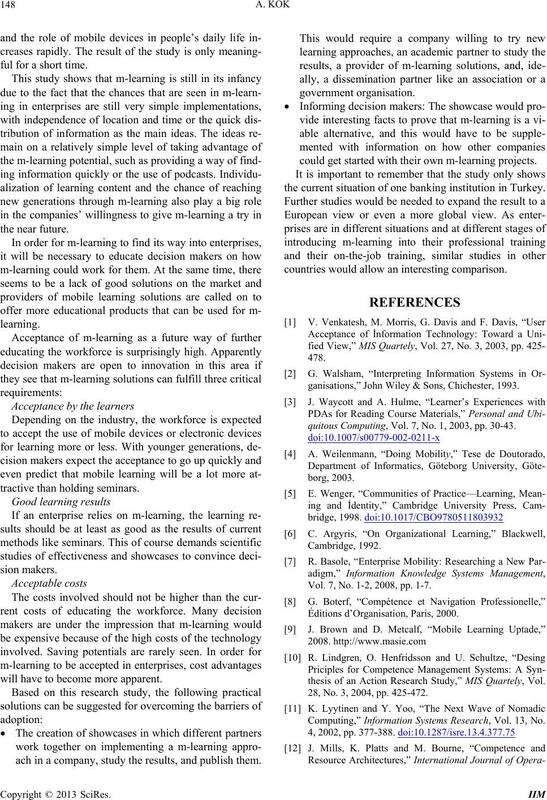 ity in enterprises to deal with matters of m-learning. ful for a short time. will have to become more apparent. ach in a company, study the results, and publish them. could get started with their own m-learning projects. the current situation of one banking institution in Turkey. countries would allow an interesting comparison. ganisations,” John Wiley & Sons, Chichester, 1993.
quitous Computing, Vol. 7, No. 1, 2003, pp. 30-43. Vol. 7, No. 1-2, 2008, pp. 1-7.
thesis of an Action Research Study,” MIS Quartely, Vol. 28, No. 3, 2004, pp. 425-472. Computing,” Information Systems Research, Vol. 13, No. Algarve, 11-13 April 2008, pp. Island, Hawaii, 3-6 January 2001, pp. 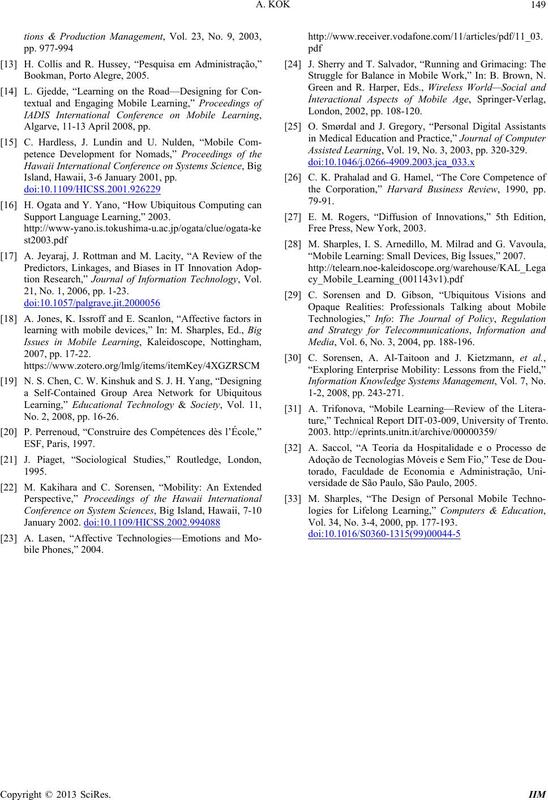 tion Research,” Journal of Information Technology, Vol. 21, No. 1, 2006, pp. 1-23. No. 2, 2008, pp. 16-26. Struggle for Balance in Mobile Work,” In: B. Brown, N.
Assisted Learning, Vol. 19, No. 3, 2003, pp. 320-329.
the Corporation,” Harvard Business Review, 1990, pp. Free Press, New York, 2003. 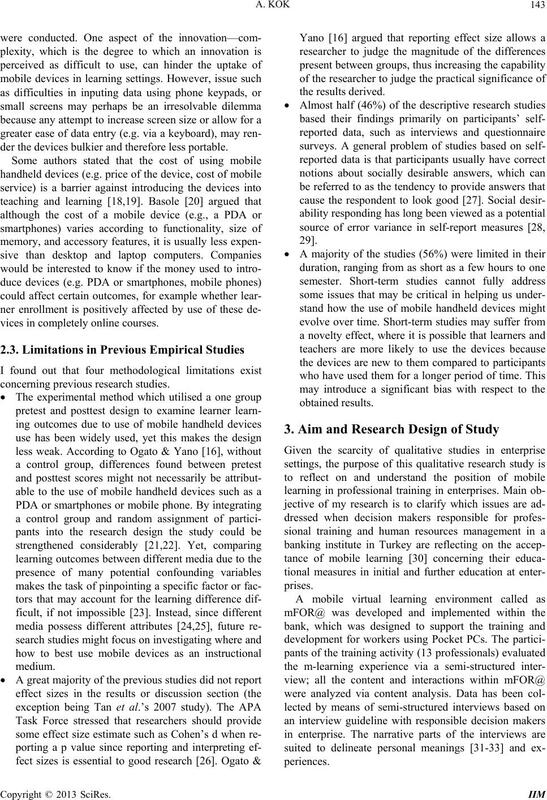 “Mobile Learning: Small Devices, Big İssues,” 2007. Media, Vol. 6, No. 3, 2004, pp. 188-196. 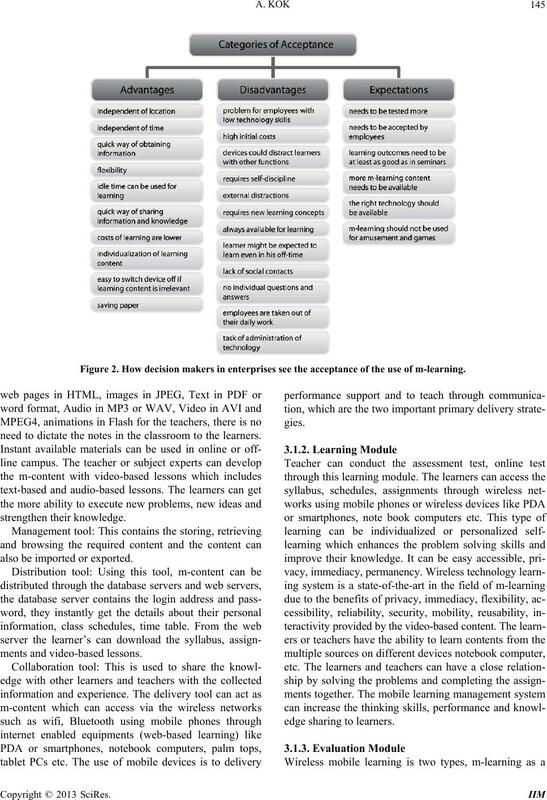 Information Knowledge Systems Management, Vol. 7, No. 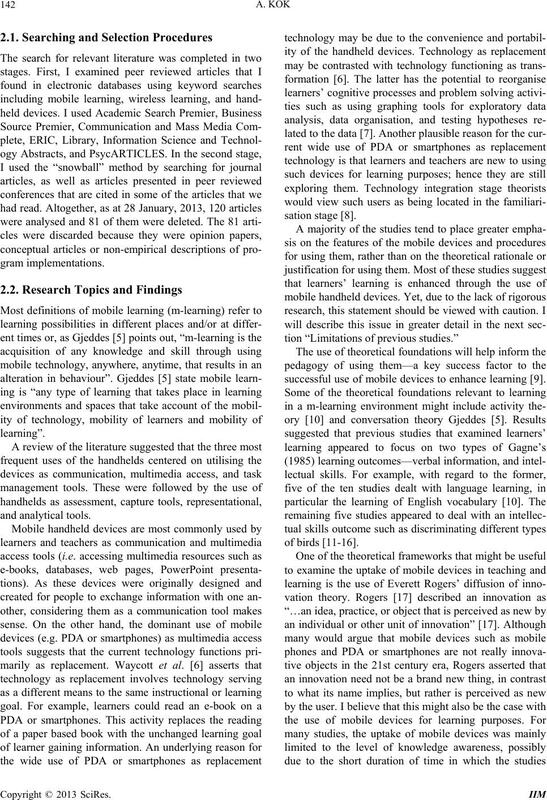 ture,” Technical Report DIT-03-009, University of Trento. versidade de São Paulo, São Paulo, 2005. Vol. 34, No. 3-4, 2000, pp. 177-193.